If you want to paint cars, you will need an LVLP spray gun. You probably don’t know much about LVLP spray guns, however. For your purposes, it needs to paint the car, but not much else, right? Buying an LVLP spray gun is more complicated than it might seem. The spray guns vary significantly across models, even if they don’t seem very different. In this article, we’ll look at a handful of the best LVLP spray guns on the market so that you will know which products to check out when you are making a purchasing decision. By the time you’re done reading, you’ll be able to be a discerning spray gun buyer. How Long Should My LVLP Spray Gun Last? What Are The Common Annoyances With Spray Guns? 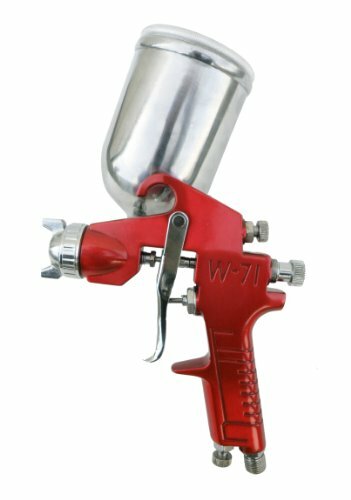 How Do I Avoid Damaging My LVLP Spray Gun? LVLP spray guns are tools that you will be potentially using all of the time, but there are many units which are simply not workable. Certain units have consistent jams, inconsistent flow, or a very small capacity which warrants continual refilling. There are a few essential features which you should care about while browsing LVLP spray guns. First, your spray gun needs to be comfortable. You will be holding your spray gun in an awkward posture for as long as it takes to get the job done. If the spray gun is too heavy or has an awkward handle for your hand, you will notice. The more awkward your spray gun is to hold, the more tired your muscles will feel and the more likely you are to compromise on your painting technique to make do. Given the heavily repetitive motions that you make while using the spray gun, it’s possible that you could give yourself a repetitive stress injury if you aren’t careful. Comfortable spray guns tend to have easy trigger pulls that are fairly light, which will avoid tiring your forearm. Likewise, they tend to have ergonomic grips that have a bit of give. The flexibility of the grip allows people of different grip strengths to remain comfortable. Hard grips are acceptable if you will be using gloves while spraying. In fact, they may be preferable. So, take into account whether you will be using gloves or bare hands while doing your spraying projects. If you plan to be wearing gloves, you will need a spray gun with a smaller handle because it will be lighter. The next feature you need in your spray gun is high build quality. Low build quality spray guns have many of their parts made from plastics. Plastics are not inherently bad for spray guns, but they tend to wear out much faster than all-metal spray guns. All-metal spray guns are not necessarily heavier than plastic spray guns. While all-metal spray guns might be heavier if they are made from stainless steel, most are made from aluminum, which is often lighter than the heavy-duty plastic. Heavy-duty plastic still wears out very quickly in comparison to even the flimsiest metal, however. Low build quality on the trigger or the nozzle group will create many headaches for you, starting with the prospect of a sticky trigger. If your spray gun has a sticky trigger, you won’t be able to stop spraying at your will. You will often need to use your trigger finger to dislodge the trigger by pushing it forward after it fails to snap back. Sticky triggers are the number one build quality issue because low-quality spray guns allow large volumes of wet paint to accumulate inside the nozzle or elsewhere. Because this paint accumulates before it is aerosolized, it is thick. It is also still a liquid. The liquid’s stickiness is then responsible for the trigger’s failure. The SPRAYIT SP-33500K LVLP Gravity Feed Spray Gun Kit is an easy to use and very accessible spray gun kit which comes with the extra parts you need to keep painting for a long time into the future. The SPRAYIT company is a bit new to the LVLP spray gun scene, but this product showed great promise. 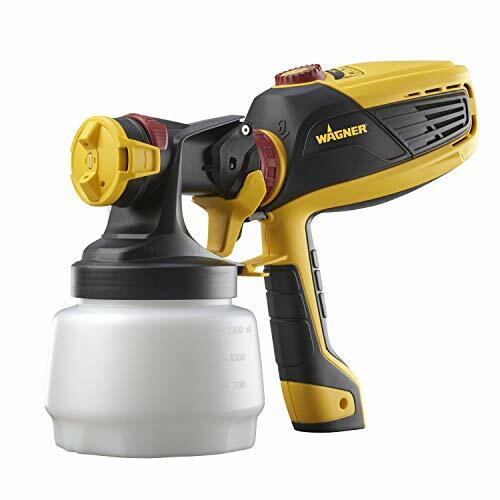 Capable of a maximum pressure of 60 PSI, you’ll find that this spray gun has an effective working pressure of about 35 PSI. These are some serious pressures for a relatively simple unit. The air consumption at these pressures is not as much as you would suspect; a mere 2.4 CFM is consumed when the gun is used at its weakest setting. 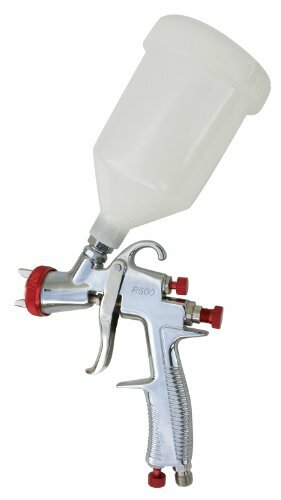 The advantages of this spray gun include multiple cup sizes and a few spare gaskets. This means that you won’t need to worry about the failure of a few individual parts because you’ll have a spare. 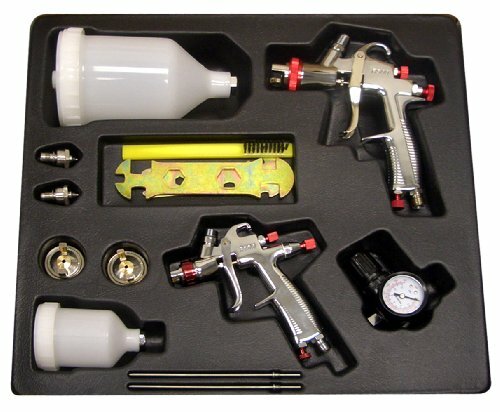 While technically the kit has two complete spray guns, most people will probably only use one and use the other for spare parts. The SPRAYIT SP-33000 LVLP Gravity Feed Spray Gun is a compact spray gun which is one of SPRAYIT’s older models. This SPRAYIT LVLP spray gun is not as sophisticated as the later model. While you can still adjust the nozzle to get different spray patterns, the SP-33000 has a cup which is somewhat lower quality than the later models. Likewise, the pressure capability of this model is much lower than the later models. You can only achieve half as much PSI at maximum pressure. On the other hand, the fact that it’s a low volume and low-pressure spray gun means that less PSI isn’t a major problem. You will need to use the spray gun from a shorter range to compensate for the low-pressure. If pressure and build quality aren’t concerns for you, this could still be a good spray gun. You should count on this spray gun lasting for a bit less time than others, however. 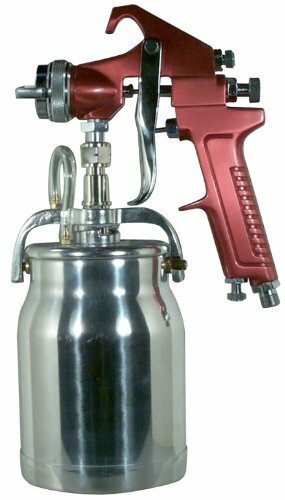 The Astro 4008 Spray Gun with Cup, Red Handle, 1.8mm Nozzle is a durable and trendy spray gun with a large capacity cup and a drip proofing system which you will appreciate. The Astro 4008 spray gun has a bunch of quality-of-life features that you will grow to rely on very quickly. The cup volume is nearly one quart, which is greater than other similar spray guns on the market. Likewise, the cup’s anti-drip system makes refilling it a much less hazardous endeavor. The unit is a bit heavy because it is made from metals instead of plastics, however. The metal build confers it much greater durability than other spray guns, but it might be tough if you aren’t very strong. Finally, the Astro 4008 is very easy to clean. If you plan on using this spray gun frequently, you should appreciate this feature. There’s nothing that detracts from the lifetime of a spray gun faster than crusted old paint. The FLEXiO 590 Sprayer is a fresh and powerful spray gun which combines ergonomic superiority with a bunch of helpful smaller features. This is probably the most comfortable spray gun you will ever use. The grip is padded, and it also molds to your hand. For very large spraying projects, you will very much appreciate these features. Likewise, the spray gun is fairly lightweight. Being lightweight means you won’t get tired while using the spray gun as quickly. The FLEXiO sprayer comes with two separate nozzle and cup arrangements, which means that you can switch between a smaller cup and a larger cup depending on the job and your preferences. The larger cup has a capacity of over a quart, which makes it very large. Regarding the spray power and volume, you can expect to use up to eight gallons of paint per hour while you are continuously spraying. For practical scale projects, you won’t need to refill the gun. The sprayer also has nine different spray speeds, which is a nice extra touch. For most projects, this feature doesn’t add much, but you never know when it might be useful for you. The SPRAYIT SP-352 Gravity Feed Spray Gun with Aluminum Swivel Cup is a high quality spray gun at an obnoxiously low price. The SP-352 has an all-metal construction. This means that the cup is made from ultra-lightweight aluminum. The power of this unit is relatively limited, but you will be able to use it for the rest of your days as a result of its build quality. Every piece of the SPRAYIT has been made minimalistically and functionally. The trigger, while simple, is surprisingly comfortable to pull, unlike many other spray guns which have fundamentally the same design. With two separate fan patterns, this little spray gun is also surprisingly configurable. Best of all, it’s one of the least expensive spray guns on the market, which makes it a favorite of hobbyists everywhere. Your LVLP spray gun will last for a very long time if it is made with high build quality. You should expect that in a low-quality spray gun the trigger or the cup will develop issues first. Especially with plastic cups, cracks can occur. It’s hard to say how long it will take for low-quality spray guns to disintegrate, but the gist of it is that high quality spray guns will last for many years. Importantly, even the highest quality spray guns have a limit, especially if they have been heavily used. With heavy use, you can probably expect a good spray gun to last you up to ten years. The biggest annoyance which doesn’t directly result in spray gun failure is dripping. Dripping can occur from any transition point between areas of the spray gun. In layman’s terms, this means that the spray gun can drip from the tip of the nozzle, from the point where the cup attaches to the gun itself, and potentially from inside the gun to the nozzle. The most common point of dripping is the nozzle. The connection between the cup and the gun is a close runner-up. Dripping after spraying leaves a big mess, and you won’t necessarily realize it until much later if the drip is small. Dripping has the potential to discolor your clothes and your floors. You can mitigate dripping by putting down a few mats while you are painting, but a better solution is to purchase a drip-proof spray gun. Drip-proof spray guns have redundant mechanisms to catch any extra paint, so they’re also more paint efficient too. Spray guns are relatively simple. They are also relatively hardy. There are, however, a few areas where it is possible for the user to accidentally damage the gun. First, you should be careful with your trigger pulls. You do not need to jerk the trigger to spray. Doing so will probably have no consequences for the first several hundred or several thousand times. Eventually, the stress the trigger pull has been imparting onto the point of connection with the gun itself might cause trigger jams. Likewise, you do not need to screw the various connectors of the spray gun to maximum tightness. It may be tempting to over-tighten all of the connections to avoid drips, but there is not much utility in doing so. As long as the system is pressurized and not dripping or making hissing noises everything is screwed in tightly enough. Over-tightening the parts of your spray gun places stress on the connectors as well as the rest of the parts. Eventually, this leads to the connector becoming stripped, after which you will have a very hard time tightening the pieces enough to retain pressure. A firm tightness is plenty. There’s no need to opt for ironclad tightness — you’ll have to untighten it as soon as you are done spraying anyway.